Literal translation: So, since there's no way to determine exactly what the hell is supposed to be going on in this illustration, here's the literal take on it. 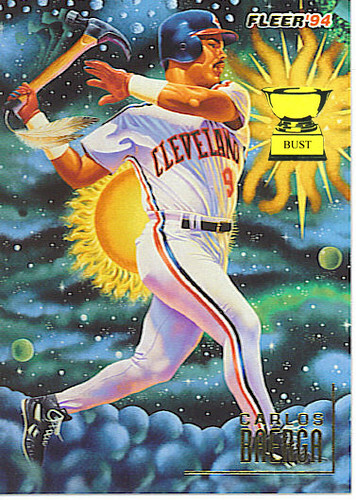 Carlos Baerga lived in outer space, where ice chips floated across the sky and poisonous vapors wafted behind him wherever he went. Baerga used a hammer with tail feathers as a bat. Instead of the batter's box, he took most of his swings from atop a giant bushel of grapes. He liked to blow up stars resembling tennis balls that exploded into giant fireworks. And, most importantly, his uniform pants were so tight, you could see the flask of whiskey in his back pocket.